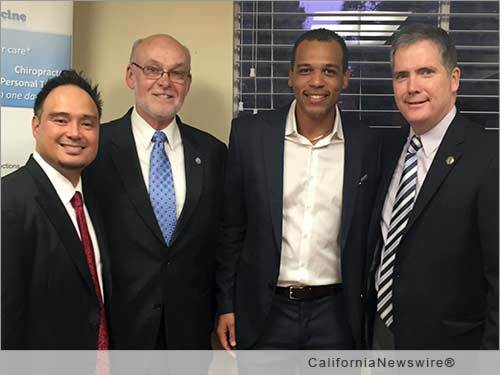 TORRANCE, Calif. /California Newswire/ — Integrated Physical Medicine (IPM) in coordination with the Unified Small Business Alliance (USBA) held a networking event on January 30, 2015 at IPM in the city of Torrance, Calif. The main purpose of this mixer was to unify South Bay businesses and encourage community members to support economic growth by shopping local. More than sixty local business owners attended the mixer and had the opportunity to introduce themselves and talk about the services they provide. Assemblyman David Hadley, Mayor Pat Furey and Councilman Tim Goodrich gave motivational speeches and took time to mingle with the audience. The attendance and support of our local officials was key to the success of this event. The USBA presented a certificate to formally welcome IPM to the organization. The clinic's Executive Director, Dr. Woelfel extended his appreciation and emphasized his commitment to continue supporting the USBA and its members. Medical Director, Dr. Simmonds also addressed the audience to thank everyone for their attendance and the USBA for their involvement and sincere concern for the success of small businesses in our community. Aurelio Mattucci, founder of the USBA, and Gabriela Fischer, Community Outreach Director at IPM, pledged to continue working together to help local business owners achieve their maximum potential by creating solutions to the challenges they face. Without a doubt, the great success of this mixer is clearly the beginning of a promising journey that will have a positive impact in the entire South Bay community.